It’s funny how, as youngsters, cricket series possibly consigned to history, bring back memories. David Battersby is possibly slightly older than me and, coming from a cricketing family, obviously enjoyed this era of cricket as much as I did. I remember this England tour of Pakistan and New Zealand in 1977-78 quite vividly and found out results from my prep school newspapers – usually the day after the match had ended. David Battersby’s In the Shadow of Packer is, therefore, a welcome memory of that series. Essentially, it is a history of all games played on the tour but David has researched the book well and, in my case, jolted a few points further back in my memory more to the front. Eight-ball overs were used, for one. Mudassar Nazar’s splendidly slow century – our old friend, Geoffrey Boycott, unsuccessfully did his best to beat it in the same match, mind you – and New Zealand’s first-ever triumph over England in a Test are two of the main memories of the tour. It is fun to look back at the scores. These were the days when visiting sides had ample warm-up games – even if it still meant some players didn’t get much of a chance – and Test scoring rates were something which younger people might be amazed at now given the phenomenal rate of scoring these days. Pakistan and New Zealand, with their markedly different cultures, makes for interesting reading. There were riots in Pakistan, Boycott’s first tenure as England captain after Mike Brearley’s arm was broken and threats of Packer players turning out for Pakistan so there was plenty of interest on the field. 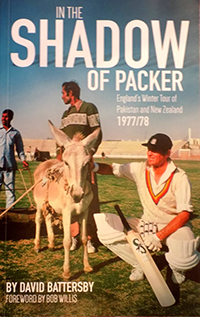 The selection of photographs is interesting also as are David’s interviews with the scorer of that infamously slow hundred, Mudassar Nazar, and triumphant New Zealand captain, Mark Burgess and, all in all, it is nice to have a record of this interesting tour within the covers of one book. There may be a lot of exclamation marks but I was certainly grateful for having memories of this tour rekindled. It certainly doesn’t seem thirty-nine years ago.